This is the next request from a Yu-Gi-Oh-obsessed customer of mine on Etsy. This has been the easiest of the characters that she has requested. 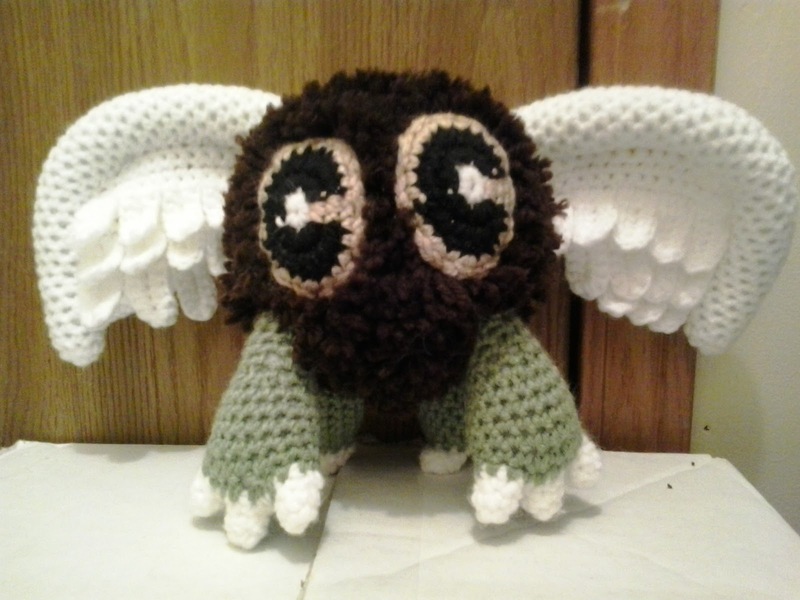 The most difficult part of making Winged Kuriboh was finding the right technique to create his furry body. If I can ever find a fuzzy brown yarn to use to make the body, I use it instead of fringing and trimming the fur. Worsted weight yarn: Coffee brown, black, white, and olive green. Finish off leaving a long tail. Weave tail through sc of Rd 23, pull tightly and secure. Weave in ends. Cut and fringe on pieces of coffee brown around each stitch of BODY. Trim FUR to desired length. Finish off leaving a long tail. Sew EYES to BODY. STUFF WING ARMS FIRMLY AS YOU GO ALONG. Finish off leaving a long tail. Sew WING ARMS to WING BODY. Sew WINGS to BODY. Winged Kuriboh and Yu-Gi-Oh! are copyright Konami and their respective creators.